About six-in-ten (62%) of Americans regard the Republicans as out of touch with the American people while 46% have that opinion of the Democrats. But Republicans are more critical of their party than Democrats are of theirs on most issues, according to a survey conducted in February. 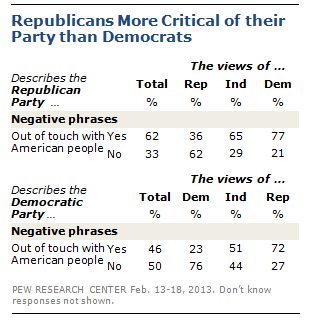 For example, 36% of Republicans say the GOP is out of touch with the American people. Just 23% of Democrats say their party is out of touch. And while 30% of Republicans say their party is not open to change, just 10% of Democrats make the same criticism of their party. A majority of independents think both parties are out of touch. About two-thirds (65%) of independents regard the Republicans as out of touch with the public; 51% say that of the Democrats.